← Start planning for your summer vacation now. School gets out, weight goes up. Why now is the time to focus on preventing childhood obesity. Obesity is a major concern for adults, linked to several leading causes of death and numerous other health problems. What you may not know is that obesity is also a serious health issue for children. It is troubling to note that nearly one-third of school-aged children and teenagers are over a healthy body weight and nearly 20% are considered obese. Remarkably, 10% of infants, toddlers, and preschoolers, are also considered obese. This is important because the common combination of poor nutrition, physical inactivity, and obesity has physical, psychological, and social consequences for children that frequently persist into adulthood. There are many reasons why childhood obesity occurs and much that can be done to prevent it. Now that school is almost out for the summer, this is a critical time of year to focus on good nutrition and activity to help prevent unhealthy weight gain in kids. This is the topic of my Health & Fitness column in the Aiken Standard this week. Overweight and obese children are at increased risk for type 2 diabetes, high blood pressure, heart disease and even stroke – conditions usually associated with adulthood. Even if an overweight child does not have these conditions now, he or she is likely on that path. Many experts predict that children born today will be the first generation in history to have a shorter lifespan than their parents due to obesity-related diseases that begin in childhood. Children who are overweight are also more likely to suffer other consequences including lower self-esteem, social functioning, and academic performance. Overweight children are also less likely to play sports or participate in other forms of physical activity. Considering that the consequences of obesity are made worse by low levels of activity, this creates a cycle leading to poorer and poorer health. There are numerous potential causes of obesity in children, but the most likely suspects are too little activity and excessive calorie intake, largely because of added sugars. Fewer than half of all kids meet the minimum recommendation of 60 minutes of activity each day and many children spend as much time watching television or playing video games as they do in school. 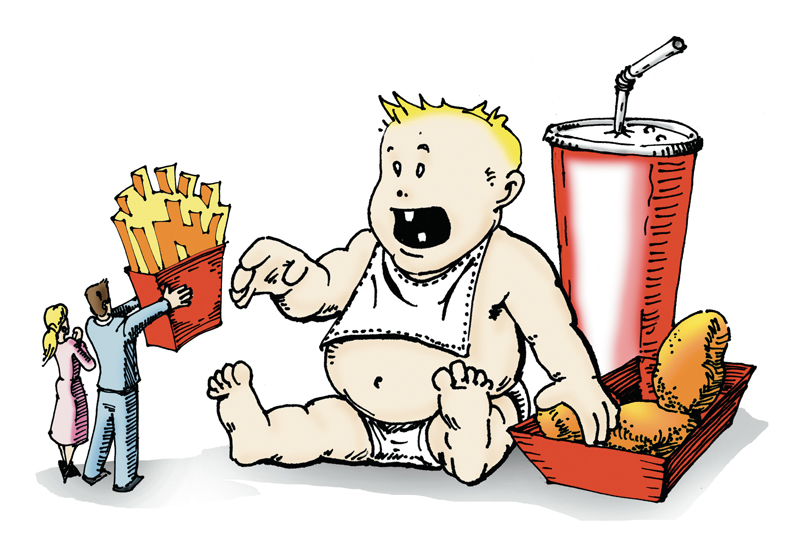 We shouldn’t be surprised that we have a childhood obesity problem! While poor nutrition and a lack of activity in schools is thought to contribute to the problem, many children get more activity and eat better at school than they do at home. A recent report suggests that children gain more weight over the summer than during the rest of the year. Furthermore, for many kids, fitness gains made during the school year are frequently lost over the summer. Since summer vacation is rapidly approaching, this is a critical time to help our children stay fit and healthy. The good new is there is much we can do. Ensuring that children get plenty of healthy foods such as fruits and vegetables, reducing the consumption of added sugars, and eating appropriate portion sizes will go a long way to addressing the diet aspect of obesity. Making sure that kids of all ages have opportunities to be active while limiting time spent sitting, especially in front of a screen, are equally important. Since children don’t make most of the decisions about their activity and diet, it is important to recognize the role that parents, grandparents, and other caregivers play. More often than not, obesity is a family issue. This means that solving the problem is a family issue, too. Adults should model healthy behaviors by making diet and activity changes themselves. A good place to start is by turning off the TV and going outside to play or for a walk. It’s something all of us—adults and children—will benefit from. This entry was posted in Uncategorized and tagged childhood obesity, exercise, nutrition, physical activity, summer vacation, weight gain. Bookmark the permalink.